Neah is a highly experienced dental nurse who is fully registered with the General Dental Council. Neah joined the practice in 2008 as a trainee dental nurse and gained her NEBDN Certificate in Dental Nursing. 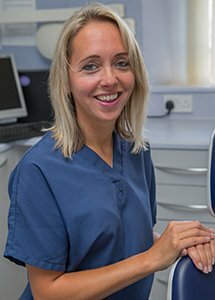 She has been working with the implant team since 2014 and as well as being an invaluable member of the implant team, Neah is also responsible for the orthodontic clinic at Torrington Dental Practice. Neah works closely with Lisa in all clinical duties, and as in an integral part of the Implant Team, Neah regularly attends implant courses and conferences to keep her skills up to date and enhance her existing skills. Out with dentistry, Neah is closely involved with various aspects of Torrington life.